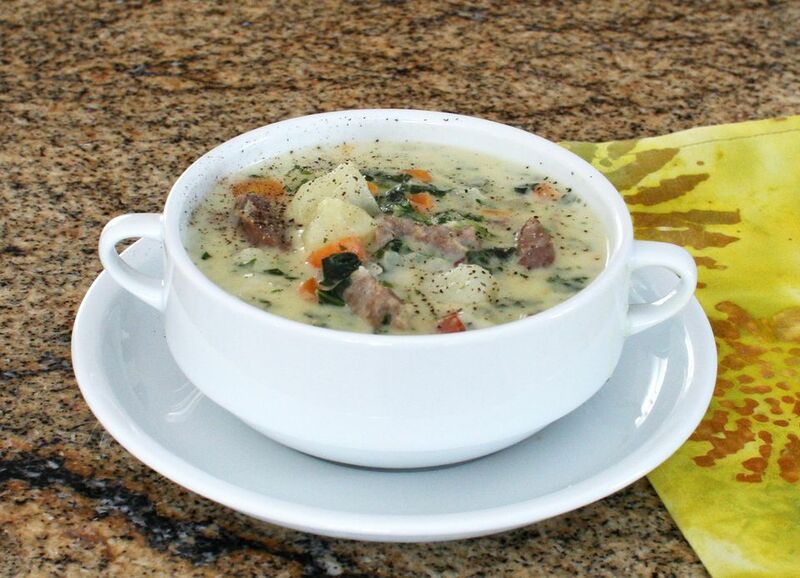 Potatoes, Italian sausage, and nutritious kale get together in this yummy soup. This thick and hearty soup is the perfect meal for a brisk fall or winter evening. It makes a great lunch soup as well. Serve cups of this delicious soup along with sandwiches or a salad. Use sweet Italian sausage or another mild or spicy fresh pork sausage in this flavorful potato soup. If you like to avoid red meat, make it with turkey sausage. The bacon provides a tasty garnish for the soup, but omit if you'd like. If you don't use bacon, increase the butter to 4 tablespoons. Feel free to use chopped chard leaves, escarole, or spinach in the soup if you don't have fresh or frozen kale on hand. For a creamier soup, reduce the amount of chicken stock to 3 cups and increase the heavy cream (or half-and-half) to 2 cups. With a fork, prick the sausages in several places. Place them in a Dutch oven or large saucepan. Add water to cover and bring to a boil. Reduce the heat to low, cover the pan, and cook the sausages for about 20 minutes. Remove the sausages to a cutting board and slice them thinly. Set aside. Put the diced bacon in a skillet over medium heat; cook until it is crisp and browned, turning and stirring frequently. Remove the bacon to paper towels to drain. Transfer 1 tablespoon of the bacon drippings to the pan used to cook the bacon. Add the butter to the pan and place it over medium heat. Add the flour to the pan and stir to blend. Continue cooking for about 2 minutes, stirring constantly. Add the chicken stock and bring to a boil, stirring frequently. Cover the pan and reduce the heat to low; simmer for 10 minutes. Add the reserved browned sausage slices and potatoes; cover and cook for 15 minutes longer. Add the kale; cover and cook for 5 to 10 minutes longer, or until the vegetables are very tender. Add the heavy cream to the soup and stir to blend. Taste and add salt and pepper, as needed. Continue cooking until the soup is hot. Crumble the reserved bacon over the soup and garnish with cheese, if desired. Serve the soup with crusty bread or buttered biscuits.